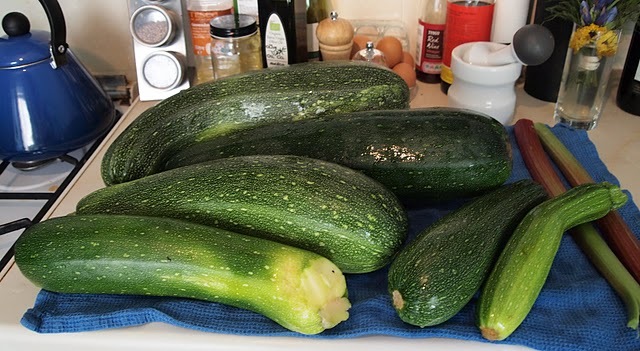 In our second year of gardening we have had a bumper crop of courgettes (some of which grew to marrow size) and a mixture of other delights. So we decided to make chutney again. Firstly blanch and skin the tomatoes, then roughly chop before putting into a pan with the courgette, apples and onions. Use a square of muslin to tie up the spices, then add to the mix with the raisins, sugar, vinegar & water. Bring the mixture to a boil then simmer the chutney on a low heat for 2hours, until thick. Put it into sterilised jam jars, seal and leave to cool. We used large kilner jars as we’d made so much! Leave for at least 2 weeks to 2 months, before consuming. Great with stilton! Gallery | This entry was posted in Recipes / Food, Summer and tagged Chutney, Food, garden, Harvest, Marrow, Recipe, Summer, Tomato. Bookmark the permalink.